A conspicuous feature of the Nieuwoudtville landscape is the low dolerite ridge (koppie) that lies about 1 km east of the town. The dolerite beds were formed during an episode in the Jurassic period (180-135 million years ago) when lava erupted across the southern African landscape. The north-south row of dolerite koppies at Nieuwoudtville are the remains of a dolerite sill. Dolerite sills and dykes are intrusions of igneous rock formed by molten magma from the earth’s mantle that forced its way to the surface through cracks in the rock layers. Cracks form when there is tension in the earth’s surface, e.g. the break-up of Gondwanaland. Dykes are vertical (or nearly vertical) intrusions of magma cutting across sedimentary layers. Sills form when the magma is able to force itself between sedimentary layers. In other words they are parallel to the layers. The dolerite is more resistant to weathering and erosion than the surrounding sedimentary rocks, with the result that the dolerite stands out from the surrounding landscape as a row of koppies. The large boulders that are typical of these koppies were formed when the magma cooled relatively quickly, forming cracks and columns of rock. Erosion has weathered the bedrock and with time, weathering has produced the spectacular balancing rocks so evident in the koppies, such as Camel Koppie. Many geophytes are able to survive by wedging their corms and bulbs between rocks, where they are sheltered from predation by porcupines, francolin, guinea fowl and other creatures that consider these underground storage organs an attractive meal. The perskussing, Lapeirousia oreogena, and the stompstert bobbejaantjie, Babiana praemorsa, are amongst the most striking of the geophytes here. Both have long-tubed, purple flowers adapted for pollination by the same specialised insect, a spectacular long-tongued fly with a proboscis about 40 mm long. 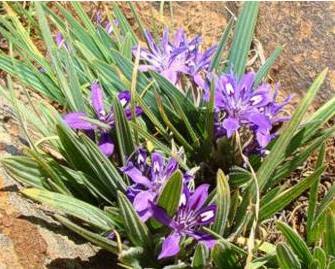 Babiana praemorsa (stompstert bobbejaantjie) is a stemless geophyte, which can grow up to 15 cm. Its leaves are narrow, pleated, hairy and blunt at the tip. The flowers are trumpet-shaped, purple, with a white spot at the lower end of the petal and a straight tube more than twice as long as the tepals. This species is pollinated by the long-tongued fly. Flowering season is July to August in dolerite outcrops. The scented arum lily is a rhizomatous, deciduous geophyte, up to 1 m tall. The flowers have a lovely freesia-like scent. Their fruiting stalks bend over. Flowering season is September to October and habitat is restricted to damp places in dolerite outcrops. 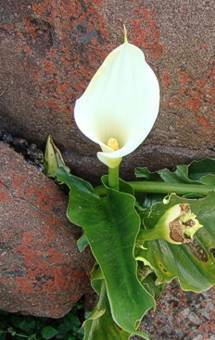 Zantedeschia odorata is endemic to the area and is Red Data-listed due to its endangered status. 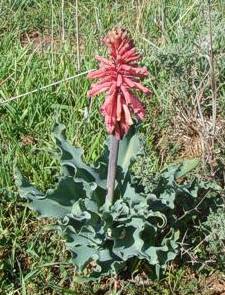 Veltheimia capensis (sandlelie) is a robust geophyte, growing up to 40 cm. Flowers occur in a dense raceme (along the main stem). They are drooping, tubular, pink with darker spots, green-tipped and about 25-30 mm long. The leaves are an unusual greyish blue. Its flowering period is from May till July. 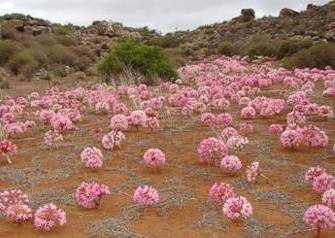 If there has been a shower of rain at the end of summer the spectacular autumn displays of the candelabra-like Brunsvigia bosmaniae carpet the koppies in pink. A sunset amongst the brunsvigias is an experience of a lifetime and a rising full moon is an added delight as the blooms appear to glow in the twilight. Flowering season is from March to May. Lapeirousia oreogena (perskussing) is an attractive stemless, tufted geophyte, growing up to 10 cm. The delicate flowers are star-shaped, purple with black and white markings in the centre. Flowering time is from August to September. 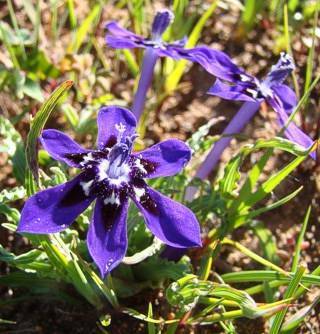 These unique flowers are endemic to the area and occur in clay soils in the Renosterveld. They are a Red Data species due to their endangered status.